Kiara is a dynamic, thirty-something girl who has reached great heights professionally, and it the apple of the eye for almost everyone who knows her. but she never took any short cuts to become happier, wiser, healthier and more compassionate. she had to find rays of hope where dark tunnel seemed unending, and identify shade in life's burning path. she found little pearls of wisdom in chasing her dreams, in spreading laughter, in learning from scriptures and philosophers, and even at one point in almost ending her life. AMISHA SETHI is a executive scholar from kellogg school of management, northwestern university, chicago and holds an MBA degree in Marketing from Amity business school. she was awarded the ' young women rising star ' at world women leadership congress 2014 and has won numerous awards and recognition in her corporate list. along with hold top notch position in leading companies in the past 13 years, she has also done extensive research in ancient scriptures. in this book, she uses certain hilarious, dramatic and enthralling experience of a young girl to understand the ultimate purpose of life - to be a better human with each passing day. Sometimes you come across a book which teaches you in a very profound way and help you in discovering your inner self.. we all are living, but rare are such people whom you met and who help you in living a life which is dedicated to others, and which is lived with a selfless purpose. trust me, rare are such authors who write philosophy and readers just can't keep that book away. one such book is it doesn't hurts to be nice by amisha sethi. it is one heck of a book. kiara's life incidents have been described wonderfully it some good philosophical touch and a pinch of lesson of good deeds at the end makes it even more amazing. 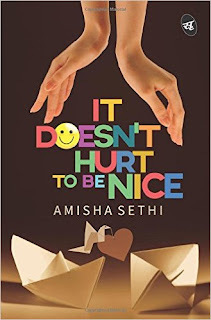 i loved the way amisha has used cute cartoon's at the starting which gives a small lesson and a short blurb about what is coming in the next chapters and some really meaningful texts . kiara's life depicts some events which actually happens in everyone's life and has shown us a way to deal with all the situations in a very simple way. the amount of wisdom amisha has is really amazing. i mean i have never seen an author so knowledgeable and the way she has expressed thoughts through little examples and instances in her book is worth a praise. teachings have been taken from BHAGAWAD GITA and UPNISHADS and will leave you thinking. 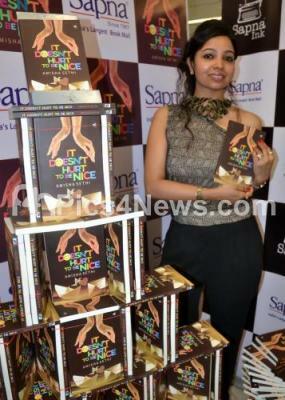 she has given the readers a way to live their life and trust me the title goes apt. with the story. overall the book will help you in being positive and will give a positive apprehension to your life.